Schuster Landscaping builds retaining walls for both commercial and residential purposes. Retaining walls are available in numerous designs, colors, shapes and sizes. By choosing the right pavers or stone our retaining walls are as cost efficient as possible. Retaining walls are ideal solutions around the home garden, to highlight flower beds, patios or features. 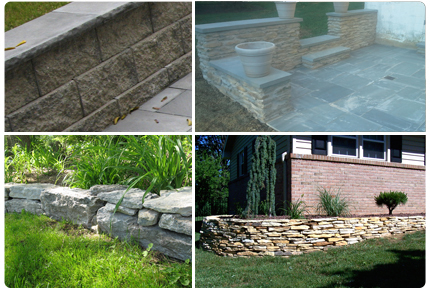 Not only do retaining walls add aesthetic appeal to your landscaping, they can also have a functional application. Retaining walls can make use of sloping or steep land and help with storm water management and drainage. Schuster Landscaping carefully reviews the area in which the wall is needed and suggests solutions based on your budget and the natural slopes and curves of your property.